Project obstacles and solutions: As part of the renovation of Ross Ade Stadium, Purdue University announced plans to create a grand patio for season ticket holders in the south end zone. This was designed to create a tailgate atmosphere inside the stadium. The area was designed to serve food and drink to up to 1.500 people at a time. F.A. Wilhelm was chosen as the contractor for this project. It included removal of the bleachers on the south end of the stadium and replacing them with a colored concrete patio with pergolas, a 3,200 square foot serving tent, and large screen TVs scattered throughout the area. Timing was critical to this job. Poured in late July, the project had to be completed for the beginning of the football season in August. Wilhelm poured the 14,000 square foot slab in one day. IMI supplied integrally mixed colored concrete to the site at a rate of 35 yards per hour for 6.5 hours, keeping pace with the finishers on the job. IMI QC/QA were on hand to test the concrete for consistency and workability throughout the pour. 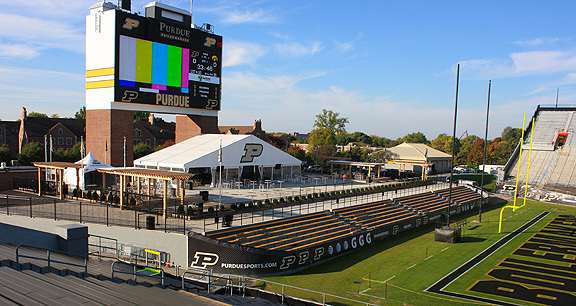 The south end zone patio opened for business on August 30, Purdue's first game of the season.